The full capacity of a G17. The superior handling of a G19. The new Glock 19X represents the perfect marriage of two quintessential Glock designs to create a handgun that fits, feels and performs like a champion. Speaking in the plainest terms possible, the 19X is a combination of the G17's full-size frame and the G19's compact slide…but it's more than just the sum of its parts. This is a Pistol with some distinct advantages of its own. If you prefer the 19 but have larger hands, the 19X will give you a little more to grab onto. If you prefer the 17, the shorter slide makes it faster to shoot, faster on target, and faster out of the holster. It's built around mostly Gen 5 internals, and comes standard with the Glock Marksman Barrel, which features enhanced polygonal rifling and a smaller crown for better accuracy out of the box. The slide comes with a durable, corrosion-resistant nPVD finish in Coyote Brown, and comes topped with night sights. Aside from the lack of an external manual safety, this is the exact same Pistol submitted for the US Military Modular Handgun System competition—so you know it's ready to perform in the most demanding conditions. It's a great gun, combining the best aspects of both the 17 and 19 to create something that's even better. Includes one 17-rd. magazine with flat base and two 19-rd. magazines with extended base. Please note that Gen 5 G17 magazines will NOT work with the 19X. However, Gen 4 G17 magazines and older WILL work. 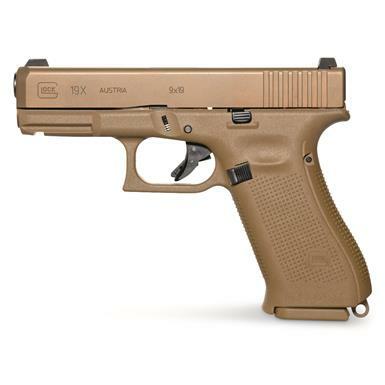 Glock 19X, Semi-Automatic, 9mm, 4.02 Barrel, Coyote Brown, 19+1 Rounds is rated 5.0 out of 5 by 10. Rated 5 out of 5 by Domsugar from I love it I have the 19x and the 45 9mm both i love if u have to pick 1 u can get either because u cant go wrong with what u pick i got both for my collection so yes im a happy camper alot of ppl talked bad about the 19x there crazy its beautiful it shoots like a glock but the handle of that baby feels good better then my 19 gen 3 that i sold yup i love both of them. Rated 5 out of 5 by Jeff B from This gun is my favorite of all my hand guns! Totally worth the price. 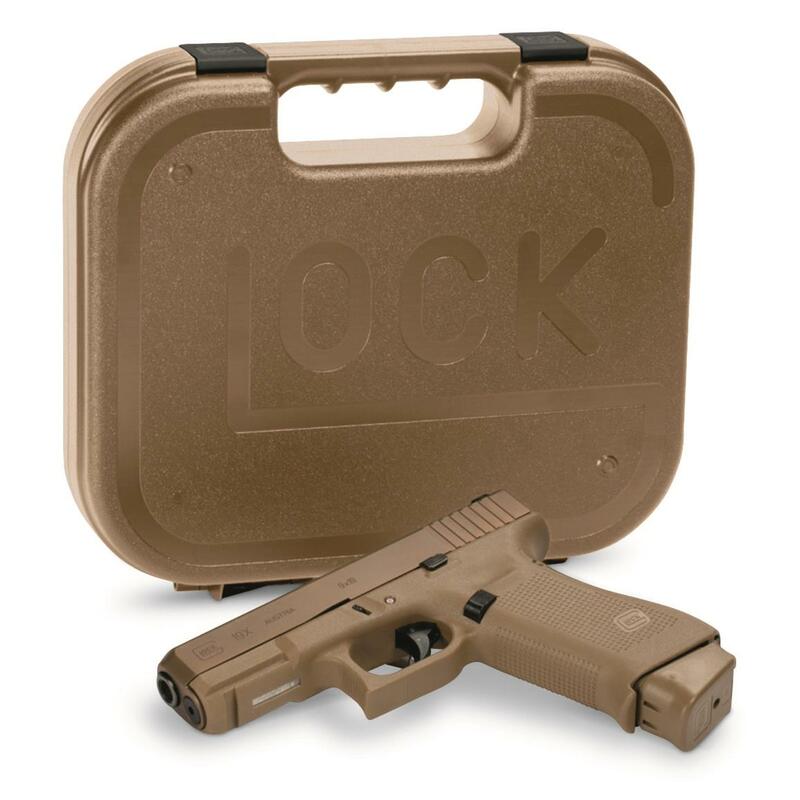 Rated 5 out of 5 by Dave111 from Great Handling Glock Was wonderful to target and shoot. Very easy to handle which makes it a great carry pistol. Highly recommend due to quick follow shots. Rated 5 out of 5 by Cozz from Must Have Glock! Sweet Glock a must have for Glock fans. Coyote brown finish looks very golden. Very unique. G17 grip is great for operators with bigger hands. 3 mags 2 with factory +2 extensions makes this buy great. Rated 5 out of 5 by Brandon S from Quality,Accuracy And Reliability High Quality Product. I have put several hundred rounds through this firearm and the quality,accuracy and reliability is without a doubt a 5 STAR Product. Excellent value especially with the night sights and extended factory magazines. I would highly recommend this item to anyone serious about a GLOCK.